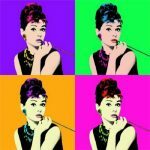 For this Meet the Masters AND Series, professional painter Cheri Isgreen will teach us about Andy Warhol and the influence Pop Art has had on art over the years. We will get to start and finish a painting learning the techniques of Warhol while enjoying a selection of Pinot wines. $40/person includes 2 drinks, light apps, supplies and instruction. SPECIAL: Sign 4 up for price of 3. Pre-registration is required.